This was the reaction from my daughter after her first muscadine tasting. It’s the typical reaction from first-time tasters. The wild grapes have a distinct flavor, and can be a bit tart before the first frosty mornings tame that tangy bite. Found throughout the hot and humid southeast, wild muscadines ripen in mid to late September around the River Valley, but you can often find them hanging on the vine and perfectly edible into late October. That is, if some other critter doesn’t get to them first. They are a favorite food of deer, raccoons, bear, fox, coyote, many birds and of course opossums. The naming of our southern wild grape is courtesy of early American settlers who christened it after the muscat grape, which is a French grape used in making muscatel wine. The word “muscat” means musky in French. So the early settlers called the musky smelling wild grapes they found here by the same name as the sweet grapes they had known in Europe, and that word changed through the years — as words often do — into muscadine. The grapes are indeed pungent. I’ve located muscadines by smell numerous times while strolling through the forest. Cousins of the widely cultivated “bunch” grapes like Concord and Catawba, muscadines grow in clusters of berries instead of bunches. Other differences include skin thickness. Muscadines are tough, thick-skinned grapes while bunch grapes tend to be more delicate. Muscadines are not only physically tougher, they are also more disease resistant, producing antioxidants to combat fungal and bacterial infections that often kill bunch type grapes. Muscadines are very tolerant of soil conditions. I’ve found them all over the place, but they seem to do best on hilltops with quite a bit of sun. Vines literally drooping with fruit often grow out of sandy, rocky, parched soil that doesn’t look like it could support a prickly pear. They thrive in these relatively arid conditions by sending out air-roots from the vines, which gather moisture from the air. Muscadines are survivors. Muscadines are a seasonal favorite for me. They are the flavor of fall right along with fried squirrel and fresh whitetail tenderloin, but it is somewhat of an acquired taste for those accustomed to store bought fruit. The defining characteristic of a muscadine is the pucker inducing jolt right after that first chomp. Most of the tang is in the skin; the meat inside is surprisingly saccharine. 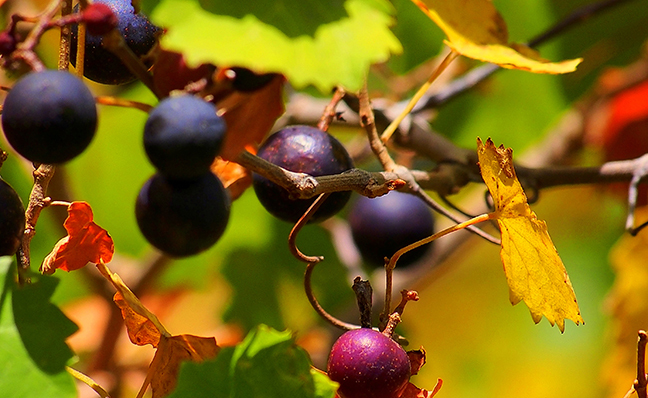 Two opposing tastes melded in the muscadine to form nature’s own sweet and sour candy. I like to eat them raw, but jelly and wine recipes abound as a treasured part of southern heritage. No matter how you eat them, once you’re hooked on the unique southern “twang” of muscadines you’ll be looking for vines and filling buckets with the rest of us.